As I begin this newsletter edition and reflect on recent College events, it is hard to believe we are in Week 6 of term. Thank you for the way you have engaged in College life to date. I have received positive feedback on the level of communication and the quality of events that have featured recently. It is truly my pleasure to be leading this community, with the support of such genuine and committed professionals who form the Carroll College team. The level of commitment and good will of the staff is absolutely commendable. As you’re aware, I have been meeting with small groups of Year 12 students for lunch each week to share their journey of this their final year, and to learn of their hopes and dreams for the future. This has been such a privilege. Interestingly, I was proofreading my daughter’s uni essay last weekend, and experienced one of those rare moments when the essence of my work aligned so closely to the life lessons we hope to instil in our own children. My daughter’s essay was based on former University of Canberra student, million-dollar entrepreneur, Mick Spencer. My daughter’s task was to report on his recently published book, “Start Before You’re Ready”. Essentially, the message I have been sharing with Year 12 students was illuminated in Spencer’s writing. Spencer advocates that success comes when you find the perfect mix of: what you’re good at, what you love, what the world needs and what you can get paid for. If you meet somewhere in-between all four of these and find balance, “you’ll never work a day in your life”. Confidence, passion and personal drive equal achievement. Spencer says, ‘Once we commit to our futures, we begin to see opportunities that we couldn’t see before. We seek out when before we remained silent. We push ourselves to our limits, and hopefully, beyond’ (Mick Spencer, 2019). The possibilities for our students at Carroll College are endless. I want them to be visionary and ambitious, and strive for greatness in whatever career they wish to pursue. Yesterday marked the beginning of our spiritual journey through Lent as we celebrated Ash Wednesday. The Lenten season is a chance to take stock of our lives and particularly our relationship with God. We are called to deepen our connection with Him through Prayer, to connect with others who may be less fortunate through Almsgiving and to reconnect with ourselves and our blessings through Fasting. Before classes commenced yesterday morning, the staff joined in prayer with Fr Steve and experienced a reverent liturgy to mark Ash Wednesday. Receiving ash on our foreheads is a powerful gesture of embracing a simple way of life, doing penance and turning away from sin. This season is one of preparation- working on ourselves to be ready for the joys of Easter. I thank Mrs Charlotte Nicoletti for her preparation of our Ash Wednesday liturgy. 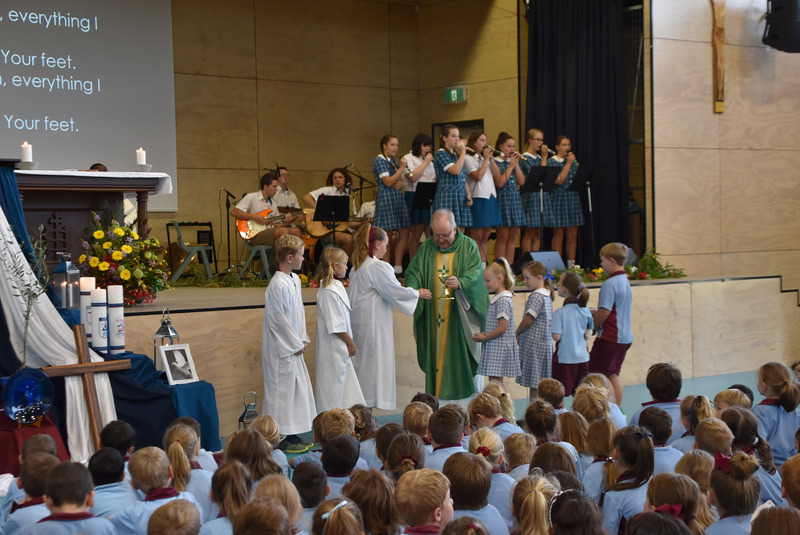 Significant celebrations in the religious life of the College do not come much bigger than the annual combined Catholic Schools’ Mass. 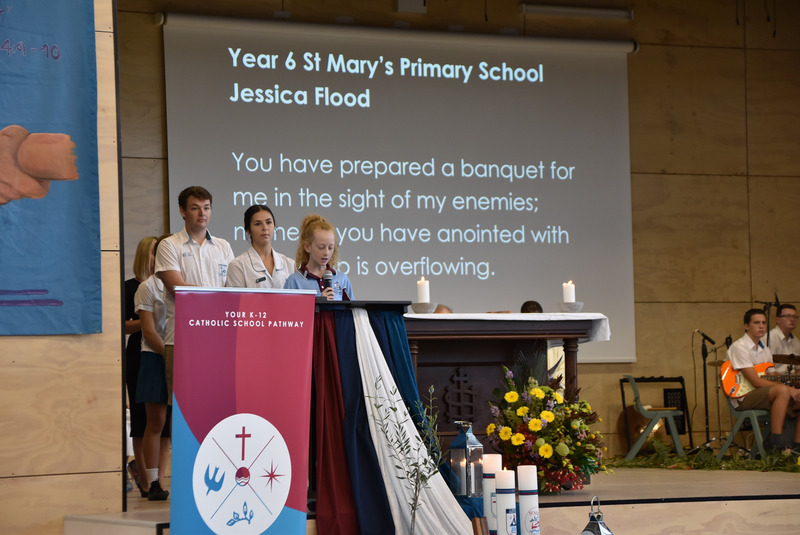 It was a beautiful occasion, celebrating the uniqueness of our Catholic schools on the Coast, from Kindergarten to Year 12. 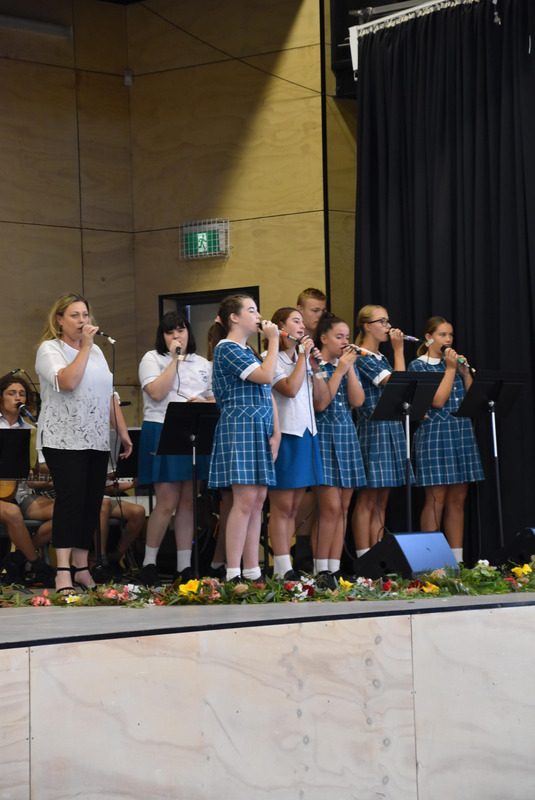 Special thanks to our musicians, under the leadership of Mrs Ros Maher and Mrs Teagan Lomax, Religious Education Coordinators, Mrs Sharon Beashel (St Bernard’s), Mrs Fran Devonald (St Mary’s), Mrs Erica Drewsen and Mrs Charlotte Nicoletti (Carroll College); and Parish Priests, Fr Steve Astill and Fr Martins Aloga. Thank you also to parents and extended family members who attended. Mr Peter Lacey, President of the South Coast History Society will be a special guest at our school Assembly next Wednesday 13 March. I congratulate Year 11 student, Teagan Moses on winning an award for her work titled, The Past Retold. Teagan receives $500 + 2 books from the National Library of Australia Publishing. 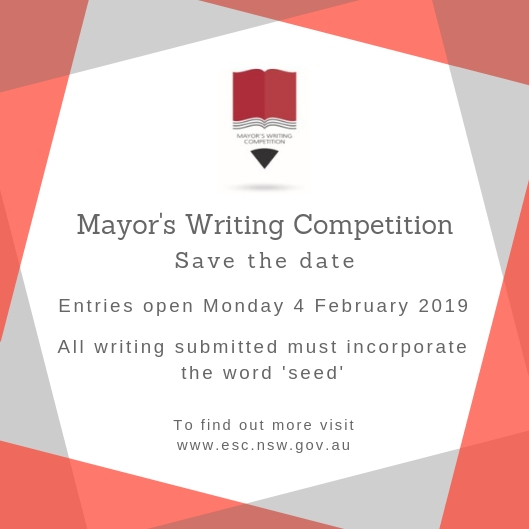 Thank you to Mrs Anna Smart for encouraging students to participate in this competition. “From Thursday the 28th of February to Sunday 3rd of March I attended the Youth Ministry Equipping School. It was an experience I will never forget because of the people I got to meet and also the opportunity’s that were given to me. It was an eye opening thing to see just how powerful God is when his people come together and unite as one. I have made friends that I will always have and met people from all over the world and have new opportunities that would never have presented themselves otherwise. I hope to be able to attend again and I encourage anyone else who has this opportunity to step forward and do it because it’s something you won’t regret”. I am pleased we can offer these opportunities to our senior students and I thank Mr Mansfield for attending and supporting the event. Congratulations to Nicholas Parr, Lachlan Knight and Nicholas Usher on their achievement in last week’s Triathlon. Excellent outcome! Our ‘campers’ departed the College yesterday afternoon with great enthusiasm. I’m sure the two day experience will be filled with laughter and adventure. 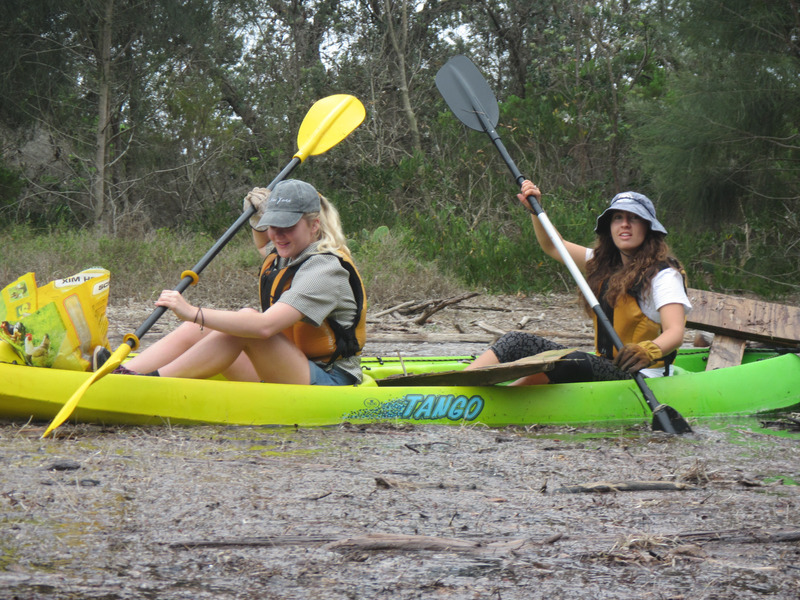 The staff accompanying the students were equally as prepared… all with enough gear to be going for a week! Special thanks to Mr Tim Hodges, Mr Jon Brady, Mrs Cassandra Johnston, Mrs Teagan Lomax, Mr Nathan Mansfield, Miss Hailee Gray, Mr Sean Mulally, Mr Niall McPherson and Mrs Miriam Shilling for braving the elements to enable our students to enjoy this great experience. I’m sure we’ll have some tired campers on their return tomorrow. Year 7 and Year 11 Peer Support Camp – organising teacher, Mr Tim Hodges. 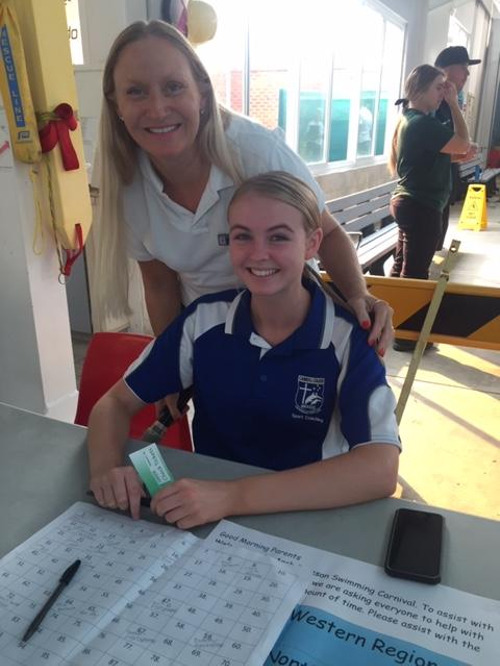 Year 8 Maths Fun Day – organising teacher, Mrs Stacey Donoghue. 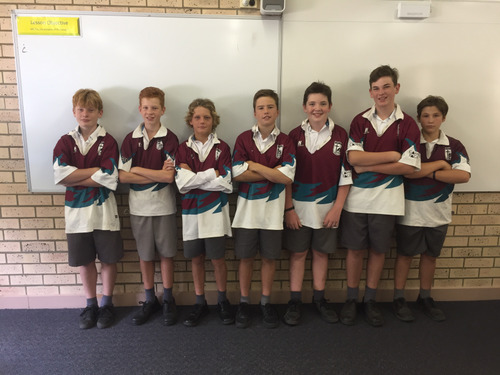 Students to wear Sports uniform. Year 9 Outdoor Activities – organising teacher, Mrs Mel Price. Students to wear Sports uniform. Year 10 Faith Formation Day – organising teacher, Mrs Charlotte Nicoletti. Students to wear Sports uniform. 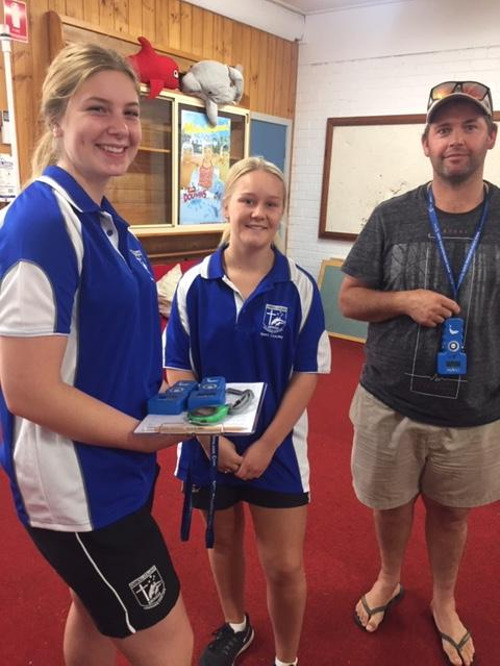 Year 11 not attending Camp – organising teachers, Mr Greg McAteer and Mrs Karen Lyttle. Students to wear casual clothes. 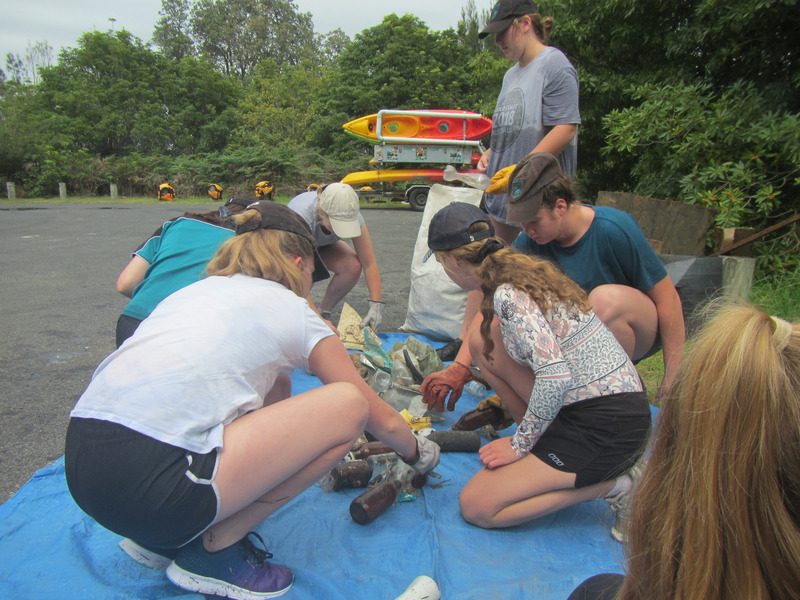 Activities include: Clean Up Australia Day, Community Service, Bush walking, Swimming Activities. Year 12 English Study Day – Mr Stephen Knight. Students to wear casual clothing. Next week, I will be attending the annual Principals’ Retreat in Bowral from Tuesday afternoon to Friday. This is an opportunity for Principals to meet and connect from across the Archdiocese. All 56 Principals attend, along with senior colleagues from Catholic Education. Peta Goldburg, Australian Catholic University Professor, will be leading the Retreat this year. Prior to the Retreat, Principals will gather on Wednesday, 13 March for the Catholic Education Leaders’ day. In my absence, Mr Nathan Mansfield will be Acting Principal. I know that recent media reports of the trial and conviction of Cardinal Pell in Melbourne has caused distress to many. In light of this, I would like to acknowledge all parents and carers for your continued commitment to our Catholic school. You send your children day in and day out, to be educated in the Catholic tradition. This important work has not changed for us and the ongoing wellbeing of your children is our priority. I appreciate this is a difficult time. Our prayers continue to be with the victims and survivors of abuse. Please don’t hesitate to contact me if you have any questions or concerns. In our next newsletter, I plan to feature staff profiles beginning with our Pastoral Leaders. I’m sure our families new to the College are still getting to know names and positions of staff, their areas of expertise and responsibilities in the College. I hope this information will assist you in putting names to faces. It’s really important that a relationship is established with your child’s teachers, and those who play an active role in the wellbeing of students on a daily basis. Student participation in extracurricular activities is vital to the well-rounded development of students and fantastic for their mental health and wellbeing, even if this means taking part in something new. 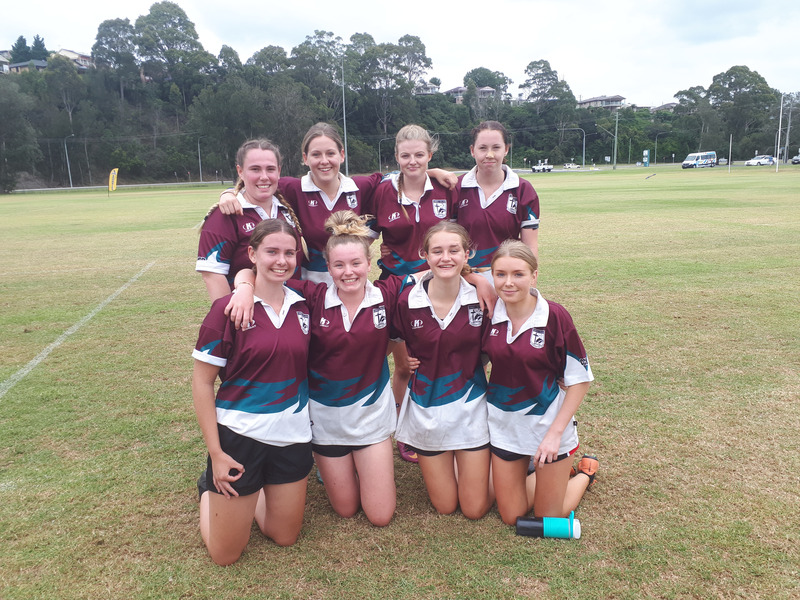 Last Wednesday a large group of students represented the College at the South Coast Rugby 7’s competition and I was part of the team who were assisting the Open Boys and Open Girls. 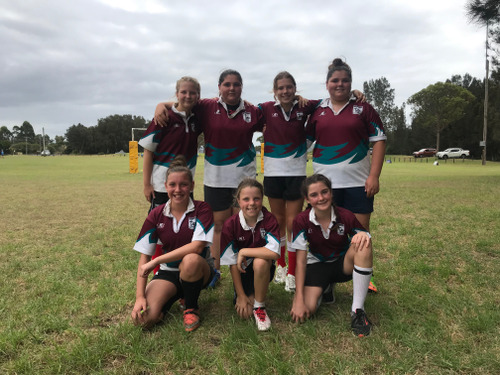 The girls were particularly nervous as many had never played Rugby and over the day they faced Batemans Bay High for three rounds who had several experienced players. 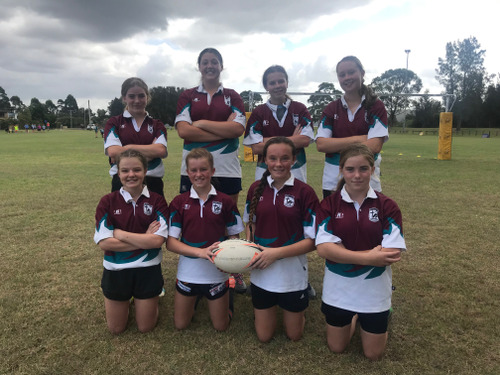 Despite this, the Girls played with great spirit and were willing to push themselves to build their skills and experience. It was pleasing to see them get better throughout the day, preserve by not losing spirit when faced with defeat and the elaboration when the team scored against stronger opposition. There was a great positive camaraderie between Bay High and Carroll College which was an outstanding example of senior student leadership to younger students and other schools there on the day. This excellent example of sportsmanship was replicated through the Open Boys games, particularly against a much stronger and experienced Erindale Sports Academy. 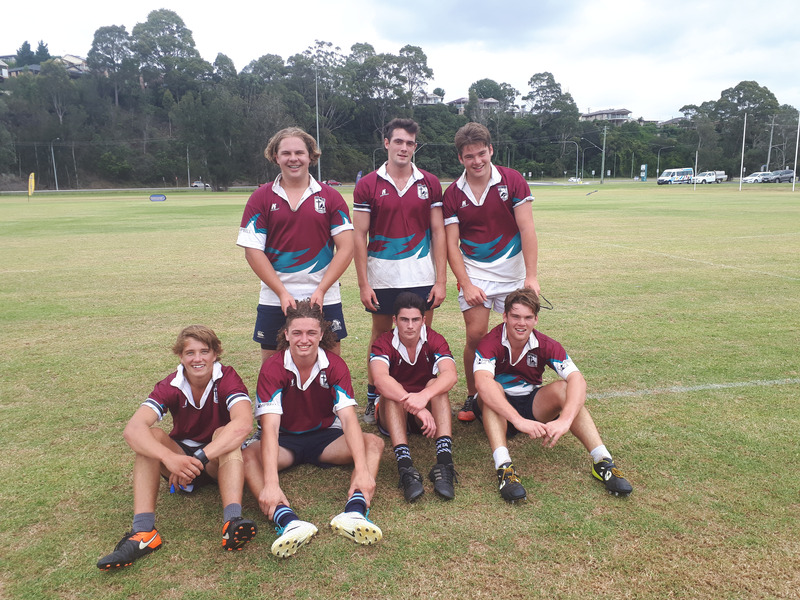 The boys played with great spirit and again demonstrated themselves as a fantastic example for the younger students at the College and other Schools in fair play. On Thursday through to Sunday evening, Ethan and Shane Mass, Liarna Miller, Destinee Zischka, Alex Quick and I attended the Oceania Youth Ministry Equipping School 2019 Conference. Delegates were present from Australia, New Zealand, Tonga, Samoa, Fiji, Solomon Islands, Uganda, the UK, and Kenya. Over the weekend students were given leadership experiences in Faith and Formation, took part in a retreat program, as well as exploring their personal faith. The conference pushed students out of their comfort zone where they had to take part in group discussions and seminars with one even having to talk in front of the whole conference about their experiences so far. 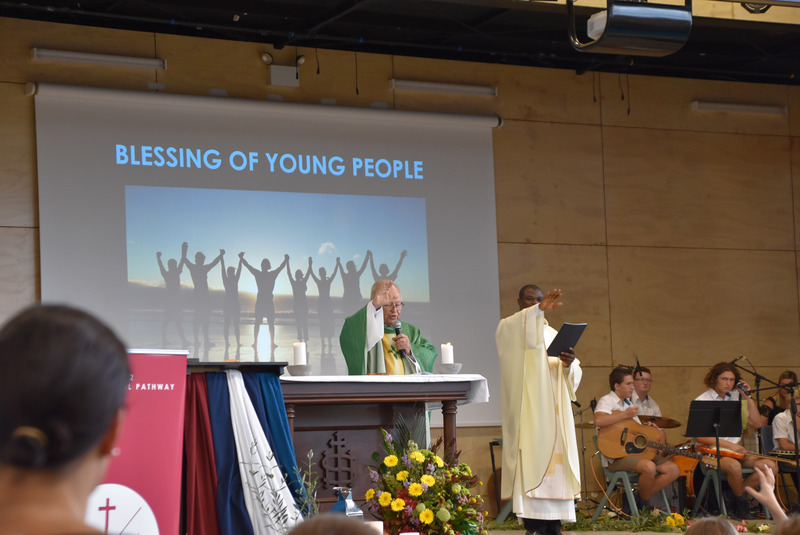 The whole experience allowed students to connect and network with other schools and countries whilst developing their own faith and will strengthen the work of the Youth Ministry program at the College. Again it was pleasing to see students establish new friendships and build in self-confidence of the four days. These are just two different opportunities that students have taken part in over the last two weeks that I have been involved in. 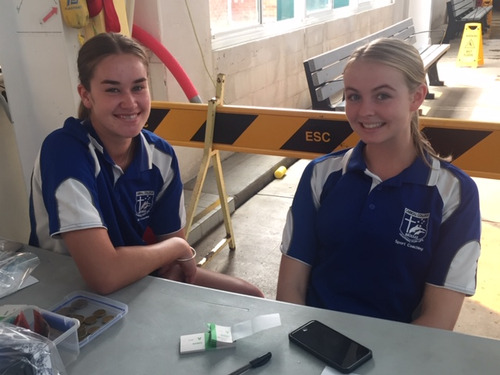 This week additionally there is the Year 7 Camp and Year 11 Peer Support Leadership Camp taking place and many other events. There are many great things to get involved in at Carroll College, make sure that you keep an eye on Sentral to see what is coming up! 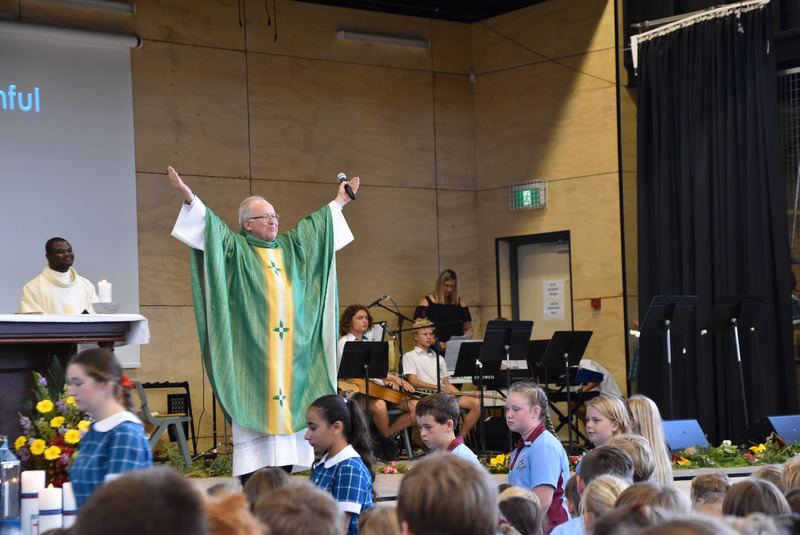 On Friday 22nd February Carroll College hosted the Combined Schools’ Mass. It was a wonderful celebration of our three Catholic schools in the region. 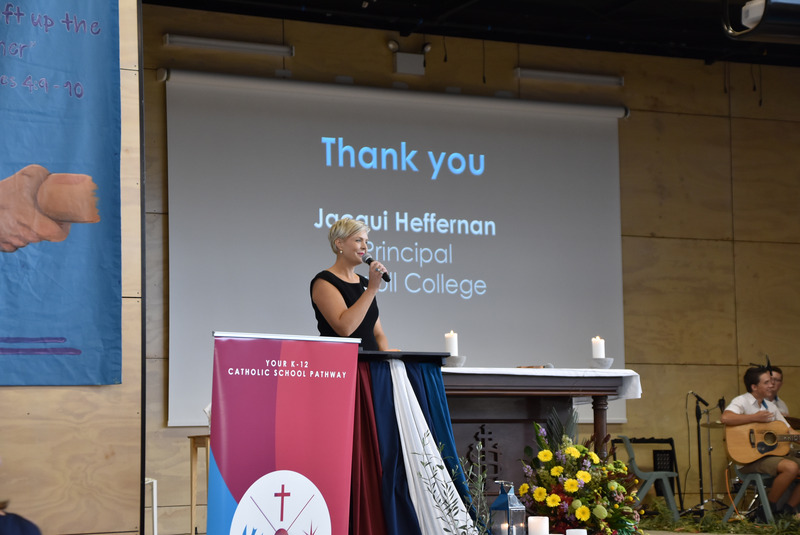 Four representatives from Catholic Education Canberra were in attendance: Tim Smith - Performance and Improvement Leader, Patrick McGrath - Principal Catholic Identity Officer, Fiona Heyman - Marketing Officer and Alex Sipinkoski - Design and Publications. The Director of Catholic Education, Ross Fox, sent his apologies. The theme of the Mass was ‘This is Me’ and was co-celebrated by Fr Stephen Astill and Fr Martins Algoa. 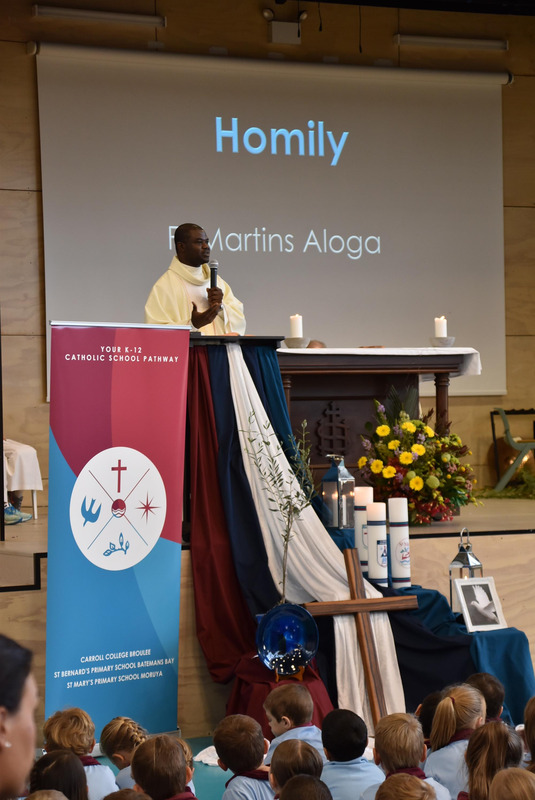 The theme fitted in very well with the Gospel of Matthew which saw Jesus asking his apostles, “How do you say I am?” At times we all feel unsure of our identity, and question who we are and if who we are is good enough. The Mass was a reminder to celebrate who are and to focus on our gifts and strengths and the wonder of each other. 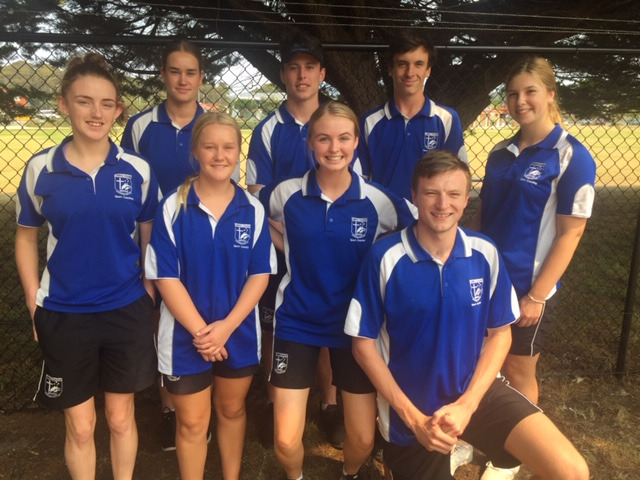 On Thursday afternoon, five senior students Liarna Miller, Ethan Mass, Shane Mass, Alexandra Quick and Destinee Zischka were accompanied by our Assistant Principal, Nathan Mansfield to Canberra to attend the CSYMA (Catholic Schools Youth Ministry Australia) Equipping School. As the name infers, this conference was designed to train and equip Youth Minsters. The event attracted participants from as far as New Zealand and our students particularly enjoyed the input shared by Cardinal Soane Patita Mafi of Tonga. CSYMA continues to offer Carroll College students an excellent opportunity to improve their leadership skills and develop a strong sense of self and others. A special thank you to Nathan Mansfield for supervising the students at the conference over the three days and nights. Ash Wednesday marks the beginning of our 40-day journey to the Resurrection of Jesus at Easter – God’s promise of salvation for all. This season is a chance for us to stop and reflect, particularly on our relationship with God. 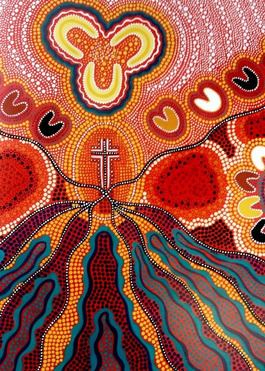 We are called to deepen our connection with God through PRAYER, to reconnect with ourselves and our blessings through FASTING and to connect with others who may be less fortunate through ALMSGIVING. All of which are offered to your child/ren at the College. Wednesday 6 March begins our Season of Lent – an important time for all members of the faith as they experience renewal and look to improve their relationship with God. Prayer: Students will commemorate Ash Wednesday with a House Liturgy and participate as one community in daily prayer. Students are encouraged to pray the Rosary and attend reconciliation during the Lenten Period. Fasting: Carroll College will unite with the worldwide Christian Community and abstain from meat Ash Wednesday and each Friday during the Lenten period. There will be no meat sold at the canteen on these days and in an expression of solidarity, I urge the community to refrain from packing meat in lunch boxes on Ash Wednesday and each Friday in the Lenten period. Lent concludes Easter Sunday. 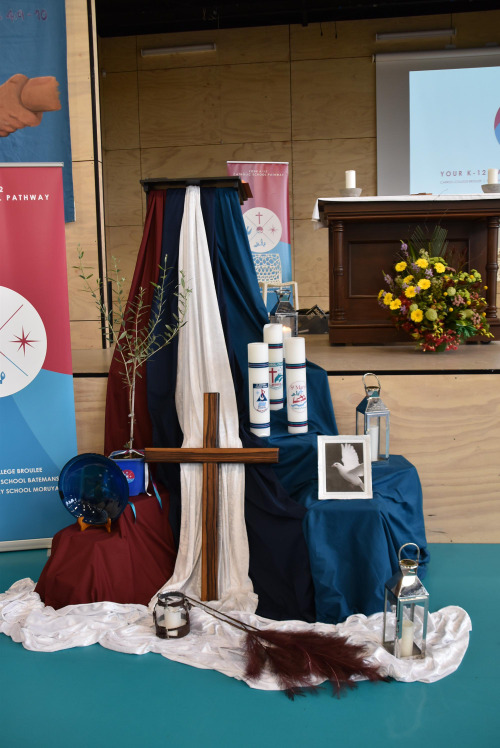 The Conference of Leaders of Religious Institutes in NSW (CLRI) also share with each of us each year another way of fasting – the Lenten Carbon Fast. During Lent we are asked to consider and minimise the carbon footprint we leave on God’s creation. Historically, flesh meat was eaten only occasionally and associated with feasting and rejoicing. Since Jesus sacrificed his flesh for us on Good Friday, we refrain from eating flesh meat in his honour on Friday’s during Lent. ALMSGIVING: Throughout Lent we are invited to give up something, so others may have something. 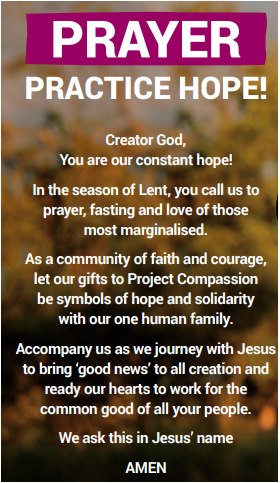 During the Lenten Season the College will raise money for Caritas Australia through Project Compassion. 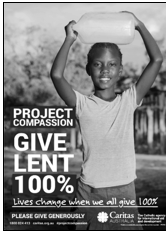 The 2019 theme ‘Give Lent 100%’ This year’s Project Compassion showcases the many ways Caritas works around the world with local partners to offer hope to people most vulnerable to extreme poverty and injustice. Through your generosity during Project Compassion this year, you are empowering communities with hope and helping those in great need to shape a better future for themselves, their families and their communities. Lives change when we all give 100%. At Carroll College, we are a faith community. The reminder of Term One allows us to strengthen our individual and communal relationship with God who has blessed us with so much. All parents should have received an email last week regarding the upcoming Parent-Teacher evenings to be held on Tuesday 12 March and Thursday 14 March. Both evenings will run from 3.30 till 7.30. Please make every effort to attend these very important meetings so you can discuss your child’s progress with their teacher. This year the interview timeslots have been increased to 10 minutes to better cater to parents. There will also be a sausage sizzle available each night. 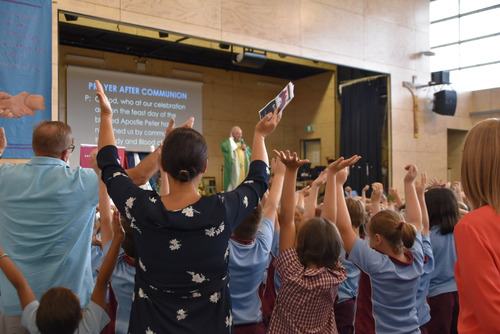 This year our Catholic Education office in Canberra has implemented a new diagnostic testing regime that they are rolling out across all 56 schools. The new tests will be implemented from Kindergarten to Year 10 and will allow schools to monitor and track our students' progress in a more targeted way. Progressive Achievement Tests in Mathematics and Reading (PAT-M and PAT-R) have a common achievement scale. Scale scores allow teachers to compare student achievement regardless of year level and the specific test completed. Carroll College will be conducting the testing in Week 9, 26-29 March. 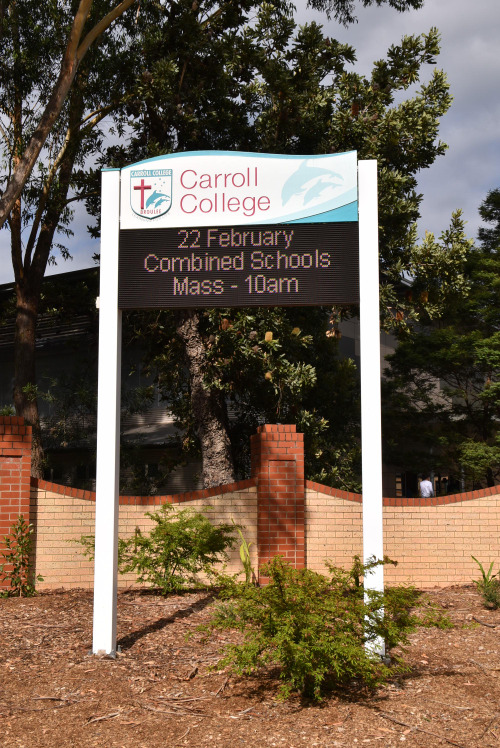 This year Carrol College will again be conducting the national NAPLAN tests via the online platform. To ensure our students understand this new format, students in Years 7&9 will undertake a practice online NAPLAN test in Week 10, 2 April. The actual tests will take place in Week 3&4 of next term. Attached to this article are copies of the parent consent forms if you wish to exempt or withdraw your child or to request special accommodations for your child. The school is able to provide common accommodations such as extra time or rest breaks based on the personal learning plans of individual students, so a form is not needed in these cases. Applications for exemption, withdrawal or special accommodations are due back to the school by 3 May. At the recent Information evenings for Year 7 & 11 parents, it was stressed how important it is for students and parents to be aware of what Assessment Tasks students have coming up. Each year the College publishes Assessment Booklets that outline the week a particular subject has a task due. (The actual due date for the tasks are posted on the Sentral Assessment Calendar, usually when the tasks are issued to students.) These booklets are available on Sentral and it is suggested that at least the term calendar at the end of the documents are printed off and placed in a common area at home so tasks can be completed in an organised and timely manner. The end of each term is usually a very busy time for the completion of tasks so any help you can provide your child in being organised will help them maintain a healthy balance in life. The difficult teen will try your patience and understanding every day. They will challenge the depths of your love, the core of your soul numerous times throughout each day, until you wonder if you have any strength left. The good teen will try your patience and understanding from time to time. They will challenge your ability to see just how many extracurricular activities you can cram into each day, until you wonder if you have any energy left. The difficult teen will skip school, even when you drop them off out front and watch them walk inside. No matter how hard a parent tries to help or force a child, the difficult teen may not graduate from High School. The difficult teen won't be going on to HSC studies. The good teen might consider skipping a class or two, but doesn't want to get caught. A parent doesn't have to make an effort to keep a good kid in school. The good teen ponders which college they should attend. The difficult teen is often withdrawn from family. They don't smile alot, they don't get real enthusiastic about much. A parent's heart breaks a little more every day. The good teen is often tells family about things that happened during their day. They smile and laugh alot, and are enthusiastic about alot of things. A parent's heart soars a little more every day. So many people give up on the difficult teen. Write them off as being unworthy of their efforts. Distrust, because they don't understand. Give up because it's the easiest thing to do. So many people cheer for the good teen. Try to help them in any way they can. Trust them, because it's not hard to do so. Encourage them to succeed because they seem to want to. It's easy to love the good teen. The parent's of them, thank God their life is going as planned. That they have good children to love. Sure, a parent loves their good teen unconditionally. But they haven't really had to put that to the test. They haven't had to test the limits of their understanding and forgiveness. Their souls and faith are intact because they haven't been shattered. Do they realise that the most important things in life are the little things? The path of the good teen may not be exactly what a parent would have chosen, but they know that everything will turn out all right. I thank God that you have a good child. It's not easy to love the difficult teen. But I thank God for them, for without the difficult teens, how can we possibly understand what unconditional love really is? How would we know just how deeply we can love, and how easily we can forgive? How would we otherwise test the endurance of our souls, the depths of our faith? How else would we realize just how strong we really are? How else would we know what is TRULY important in life. I welcome your feedback and ideas for future articles. Introducing our 2019 Staff and the courses running this year. A VET induction day will be happening for the new Year 11 VET students on Thursday 14th March at school in the HUB. They will meet with a representative of Work Place Learning who will support them with their work placements over the next two years. Sport Coaching has already begun their work placement over the past few weeks. 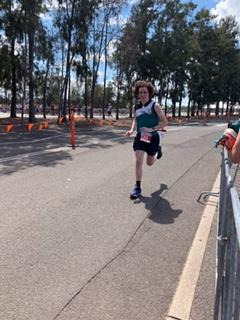 Helping the Catholic Primary Schools run their swimming carnivals. 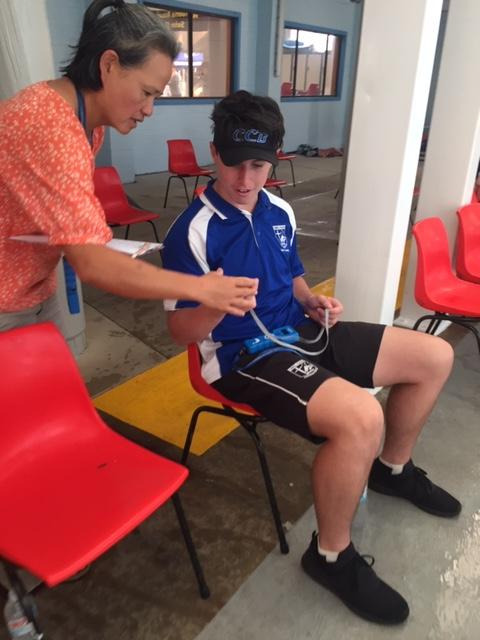 On Monday 3 Year 11 Sport Coaching students and 5 Year 12 Sport Coaching students assisted in running the Primary Schools Archdiocesan Swimming Carnival in Narooma. Once again the students have shown initiative and maturity, working alongside staff and parents from the participating schools. 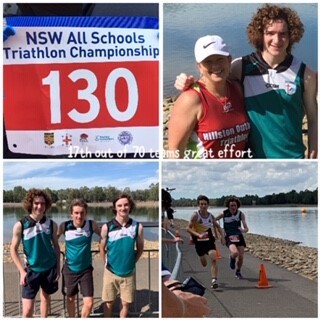 On Thursday the 28th of Feb, Nicholas Parr, Nicholas Usher and Lachlan Knight participated in the CCC Triathlon teams event in Sydney. The boys competed very well on the day and came in at a respectable 17th out of 70 teams. A great effort for our first ever entry into the teams event. Thanks to all the parents who helped support on the day. 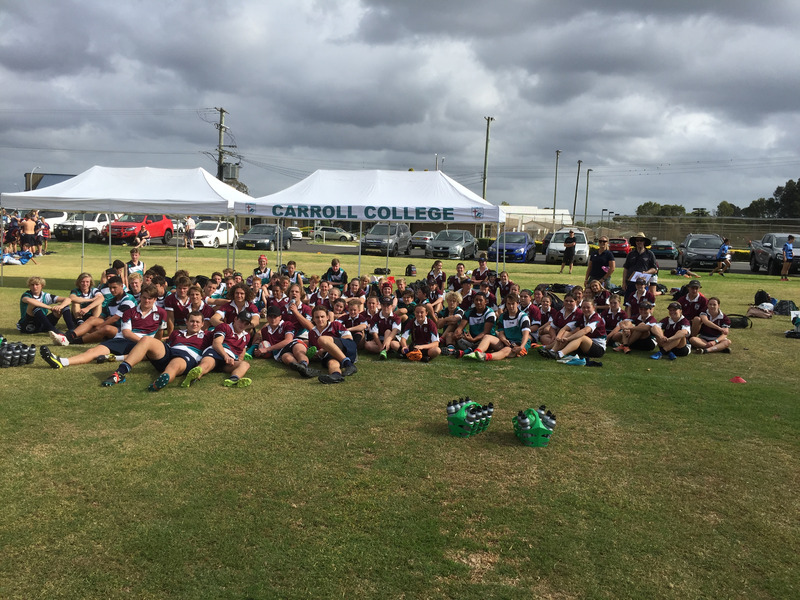 On Wednesday the 27th of February, Carroll College had almost 90 students in eight teams participate in the South Coast High School Rugby 7s. 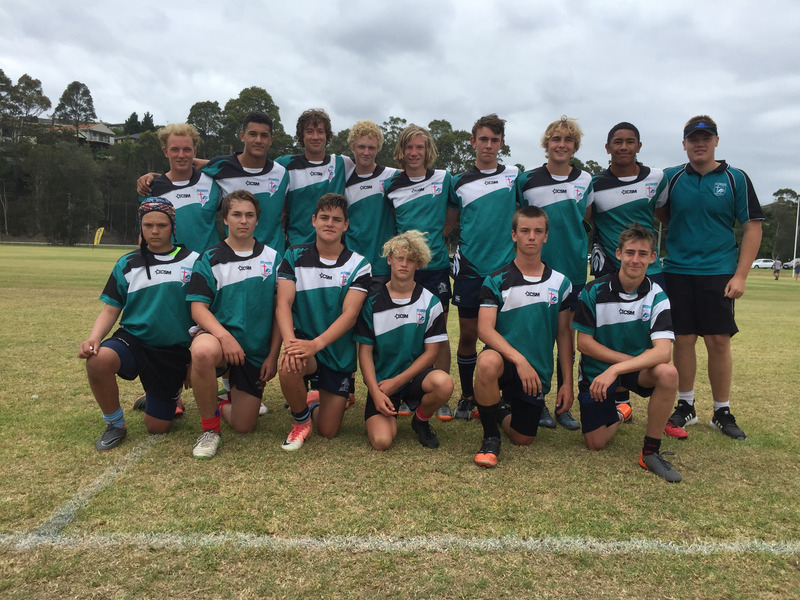 This year the tournament included seven schools from as far south as Pambula. 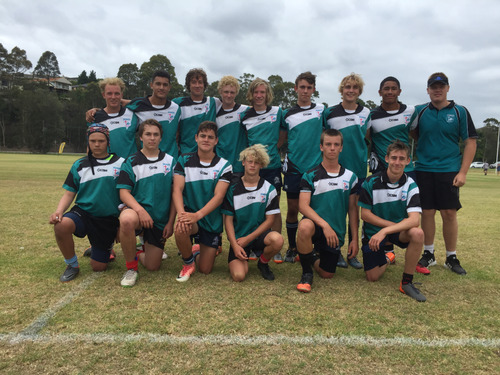 The tournament, run by Brumbies Rugby was held at Hanging Rock Playing Fields. As always our students represented our college with exemplary behaviour and wonderful sportsmanship. 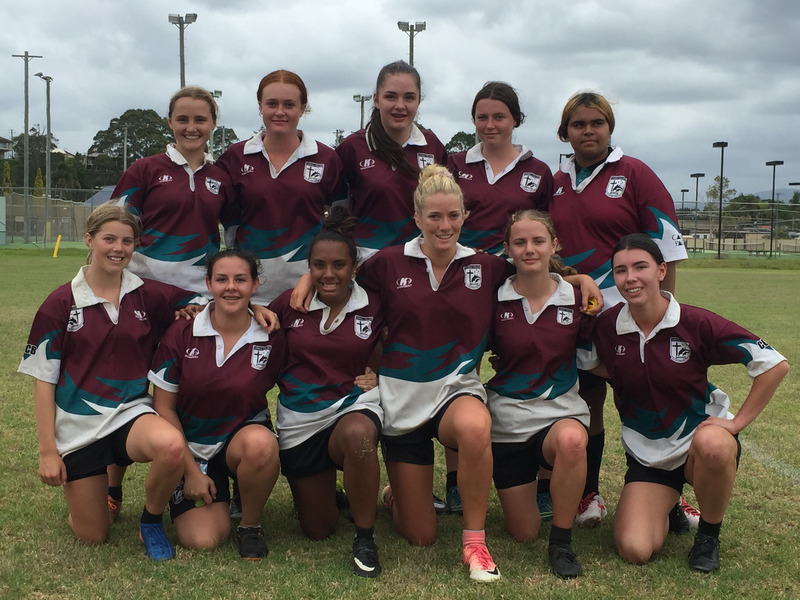 For many of our students it was their first game of rugby whilst many others were seasoned campaigners. 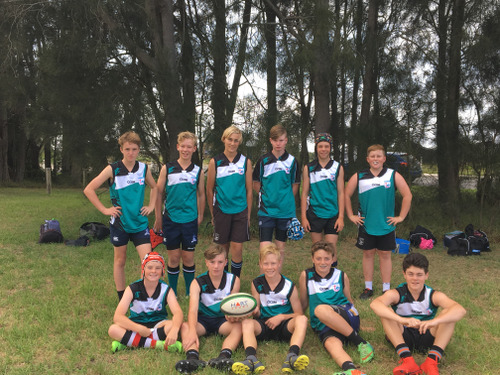 They all played exciting and attacking rugby and learnt a lot about the game along the way. Thank you to Mrs Katuke, Miss Gray, Mr Mulally and Mr Mansfield for coaching and managing our team on a very busy day of rugby. Thank you to our students for your excellent behaviour, great sportsmanship and ensuring are areas were clean and tidy before we left. 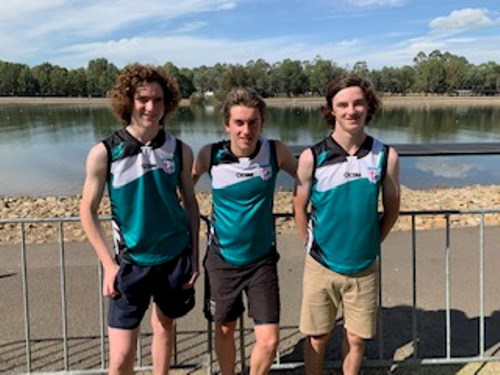 As tournament champions, our Year 7/8 Girls, Year 7/8 Boys and Year 9/10 Boys squads will travel to Canberra in September to contest the ACT and Southern NSW Finals. 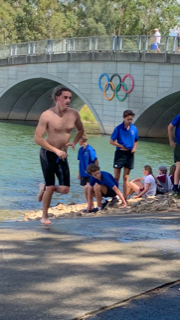 “On Tuesday 26th February, 22 Carroll College students attended the Canberra/Goulburn Archdiocese Swimming Championships at Goulburn Aquatic Centre. With a beautiful day providing perfect swimming conditions, our students set about doing their best to try and qualify for the Canberra/Goulburn team to compete at the NSWCCC championships later this term. A lot of personal bests were made by our swimmers, and a total of eight students finished top three in at least one event. A special mention must go to the four CCB students who were awarded Age Champion for the day: Skye Wildman (Year 7), Phoebe Rankin (Year 9), Jordan Carter (Year 11) and Lachlan Knight (Year 12) who will all progress to the NSWCCC championships, along with Sam Patmore who also qualified for the Canberra/Goulburn team. 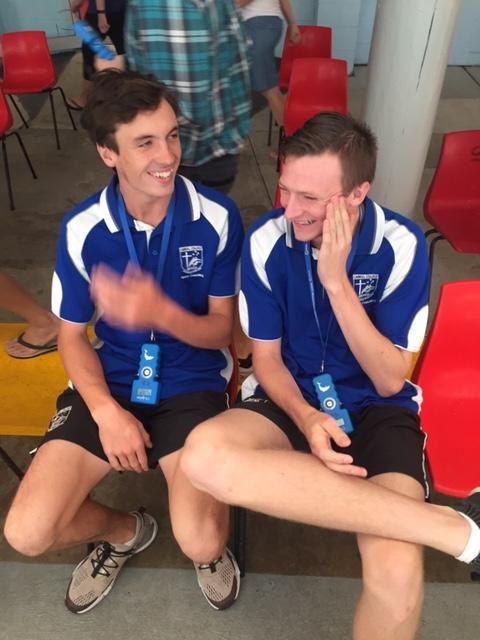 We also had Lachlan Knight who broke the Boys 17+ 200m Freestyle record for Canberra/Goulburn, along with Jordan Carter who incredibly broke the Canberra/Goulburn record in SIX Girls 17+ events (50m, 100m and 200m Freestyle, the 50m Butterfly, the 50m Breaststroke, and the 50m Backstroke). A big thank you must also go to Julie Knight who acted as Team Manager on the day, along with the other Carroll parents who assisted with timekeeping throughout the day. Your help was greatly appreciated. The Carroll College swimming team included: Jakob Barbara, Harry Barrington, Erynn Carter, Jordan Carter, Sophie Epplestun, Ben Fish, Harry Flavell, Lachlan Knight, Felicity Lotze, Jet Love-Maxalmena, Claire Mass, Madeline Mitchell, Damia O’Loughlin, Sam Patmore, Emma Penberthy, Sarah Penberthy, Meg Phillips, Daisy Quinn, Phoebe Rankin, Ryle Schuchmann, Oliver Warren, Skye Wildman. On Thursday the 21st of February 9 members of the Rosellas, the College’s environmental justice group, volunteered to be involved in a marine debris clean-up at Quandolo Island, Moruya. 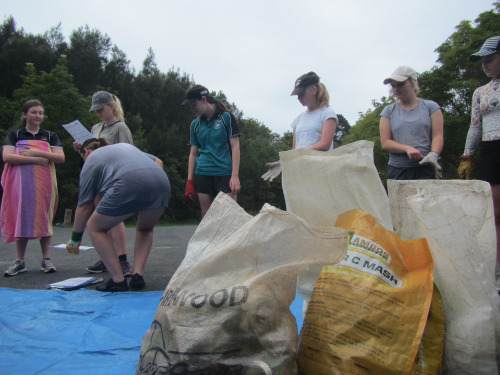 The event was run by Bernadette Davis, Eurobodalla Council’s Environment Education Officer, and Ella Hodges, who graduated from Carroll College last year and has worked closely with Bernadette on other projects, locally and internationally. 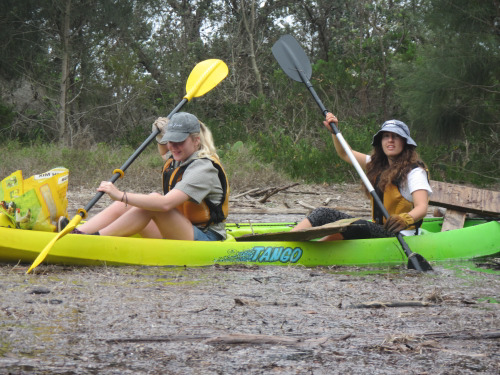 Students navigated the river in kayaks provided by Tom Wells, who joined the clean-up, and Josh Waterson from Region X Unspoilt Experiences Batemans Bay NSW. The debris polluting the area totalled to 23 kilograms. 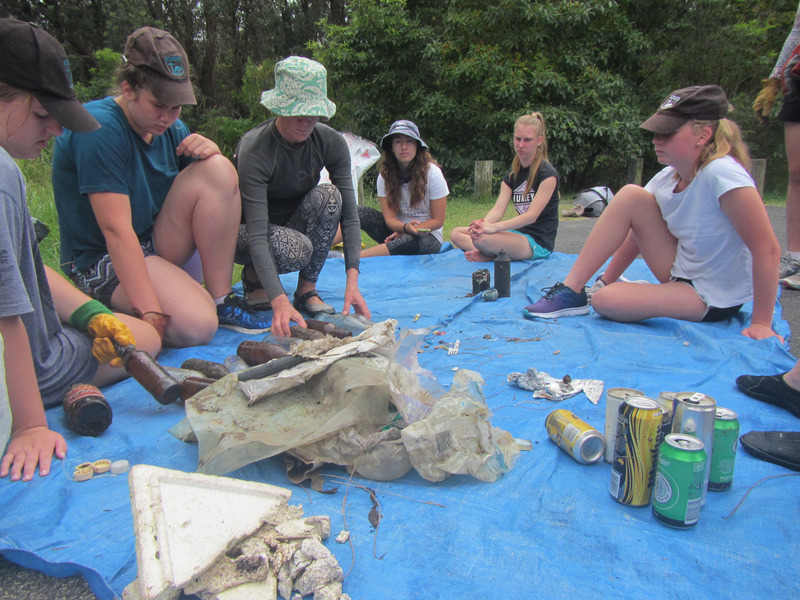 Each piece collected, was recorded to grow the Australian Marine Debris Initiative Database. The day was a great opportunity to participate in an environmental justice initiative and the Rosellas have plans to continue their efforts improving the school’s environmental footprint. Thanks to Mrs Enfield for organising the activity. Did you know that students are able to access Office 365 for free. There is no need to purchase this software. Students’ should enter their College email address e.g. This software can be used when students are working on assessment tasks unless specific software is requested as part of the task. Students can access this software at the College and at Home.